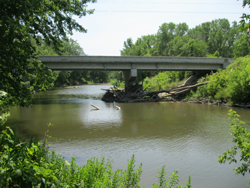 Debris accumulation on bridge piers is an on-going national problem that can obstruct the waterway openings at bridges and result in significant erosion of stream banks and scour at abutments and piers. In some cases, the accumulation of debris can adversely affect the operation of the waterway opening or cause failure of the structure. In addition, removal of debris accumulation is difficult, time consuming, and expensive for maintenance programs. This research involves a literature search of publications, products, and pier design recommendations that provide a cost effective method to mitigate debris accumulation at bridges. In addition, a nationwide survey was conducted to determine the state-of-the-practice and the results are presented within.